In a feature for Esquire, number cruncher and future predictor Nate Silver ponders the continuing decline in per capital vehicle miles traveled. 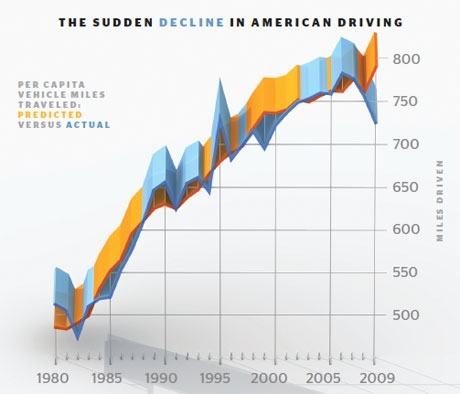 Americans are driving less. Significantly less, in spite of major drops in gas prices since last year. Certainly the economy has something to do with this. Fewer people are driving to work since few people have jobs. But Silver doesn’t think the economy explains the decline. To sort this out, I built a regression model that accounts for both gas prices and the unemployment rate in a given month and attempts to predict from this data how much the typical American will drive. The model also accounts for the gradual increase in driving over time, as well as the seasonality of driving levels, which are much higher during the summer than during the winter…. The model predicts that given a somewhat higher unemployment rate but much lower gas prices, the lower gas prices should have won out: Americans should have driven slightly more in January 2009 than they had a year earlier. But instead, as we’ve described, they drove somewhat less. In fact, they drove about 8 percent less than the model predicted. Silver believes Americans may, in fact, be changing their habits. He looks at recent home values in a variety of cities and sees that more car-dependent cities have fared worse than less auto dependent cities. Still, Silver presents cities as relatively static places, and planning and design are largely absent from his analysis: “In the real world, of course — outside perhaps a half dozen major metropolitan areas — American society has been built around the automobile.” For at least the last decades communities across the country have been employing a variety of means to promote walking and biking, from building mixed use, higher density neighborhoods, to adding bike lanes and light rail lines, to banning cul-de-sacs, to investing in downtown developments. America, in some places at least, is not being built the way it was twenty years ago. Certainly these efforts must have some cumulative effect.